John Romero is back in the game, quite literally, with the announcement that he'll be revealing a new PC shooter at the start of next week. Romero, who co-founded id Software and co-created the original Doom and Quake among other titles, has stuck a video on YouTube entitled 'The Return', which ends with the revelation that there will be an announcement on April 25, next Monday, regarding a project from Night Work Games. The website linked contains little information on the game but does state that: "A new first-person shooter is being built at Night Work Games in Galway, Ireland." 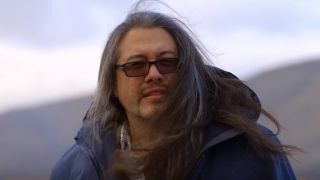 The YouTube video clip shows Adrian Carmack, another of the co-founders of id Software, wandering through what we assume is the Irish wilderness, eventually coming across a hooded figure – John Romero himself. Carmack then makes a symbolic offering to Romero in the ending of this short parody scene which most of you will doubtless recognise. Check out the video below for yourself, but at any rate it's clear enough that Carmack is going to be part of this project alongside Romero. John's partner, Brenda Romero, also confirmed the two will be working together when she tweeted: "John Romero & Adrian Carmack return to FPS #shooter #pcgame". Over at the Night Work Games site you can sign up to be sent further details on the shooter as updates emerge. But for now, we just have to wait until Monday and hope something more concrete is revealed. Romero has actually been talking in vague terms about a new shooter for the past couple of years, so it seems that wasn't just idle chat. Here's hoping this effort makes up for Romero's hugely disappointing Daikatana which was a much hyped and then universally panned FPS launched back at the turn of the millennium.